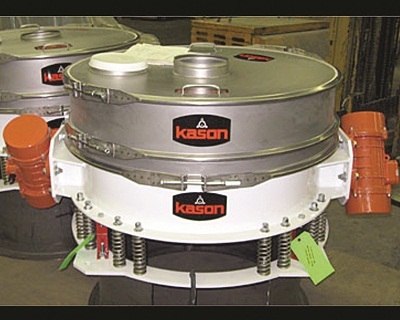 Kason has introduced an ultra-low-profile 40 in. (1016 mm) diameter Flo-Thru Vibroscreen® sifter with flat dust cover that fits tight spots between storage and process equipment. The sifter employs two imbalanced-weight gyratory motors mounted on opposing exterior sidewalls of the unit, instead of one motor positioned beneath the screening chamber, reducing overall height significantly. The design also allows vertical alignment of the top inlet and bottom outlet, causing on-size material to descend through the screen in a straight-through path at high rates. Oversize material is ejected through a spout at the periphery of the screen. The unit is intended for installation above or below storage vessels, bulk bag and drum unloaders, bag dump stations, blenders/mixers and other process equipment, and can be installed with minimum alteration to existing layouts.